Powerful yet easy to use, our sleek JumpPlus unit safely jump-starts your vehicle & charges any mobile device. Comes with jumper cables, AC wall charger, 12V car charger, 4-in-1 USB cable & case. Makes jump starting a one-person job - fast, safe & simple! Unlike other units we've seen, JumpPlus has a built-in power bank with high-tech Type C input. So you can use it to charge your phone, camera, tablet, laptop & much more - including the latest Type-C-only devices! Forget bulky starters that look like they only belong in your car. JUMPPLUS looks like a power bank you can take anywhere. Keep it in your glove box or backpack for convenient charging on the go. 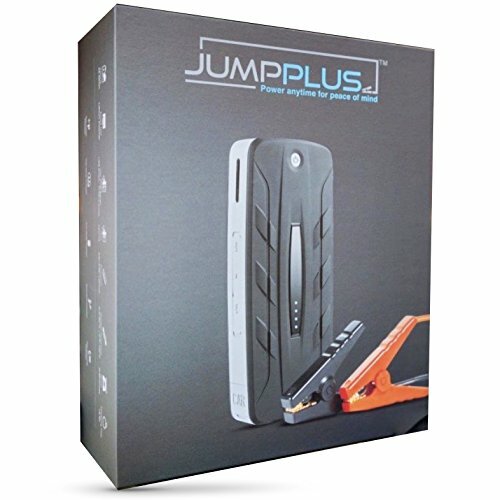 Order your JumpPlus now...for yourself and all the drivers you know! HELPS YOU STAY SAFE: With Jumpplus, you can jump-start your car by yourself, quickly & easily. Plus, with our super-bright built-in LED light, you can see & be seen in the dark. POWER TO SPARE: Rated for 5.0L gas & 3.0L diesel vehicles, your sleek, compact Jumpplus jump-starts cars, trucks, SUVs, vans, boats & more. Peaks out at 550 amps. CHARGE ANY USB DEVICE: With a regular USB port PLUS its exclusive Type-C USB port, the JumpplusTM is a power bank for all devices including your Phone, tablet & USB-C laptop (1 Full Charge). Other power banks may charge a few more times but they won't also jump start your vehicle. The JUMPPLUS does both for you. 1-YEAR MANUFACTURE'S WARRANTY: Built for years of use, your premium Jumpplus comes with our special promise: If you find any defects within 1 year of delivery, send it back for a free replacement. WHAT'S INCLUDED - JumpplusTM Jump Starter, Safety Smart Cables, AC Wall Charger, 12V Car Charger, 4 in 1 USB Charging Cable, all in a Quality Compact Storage Case. If you have any questions about this product by Jumpplus, contact us by completing and submitting the form below. If you are looking for a specif part number, please include it with your message.